With the regularity of the clock. We tried so far with this Newsletter. But it does not work like that in carillon land. One moment it is the singing rookie season; then it is campanological cucumber time. Thus our newsletter will henceforth be delivered in smaller portions, yet more often than in the two-month interval you have been used to. You can also see news reports at a glance and then click on the longer articles and announcements. We hope the new setup will be satisfactory. We would like to hear your reaction. And above all - including our readers in the non-low countries – keep sending us announcements, notifications of special events, messages and current-affairs articles. 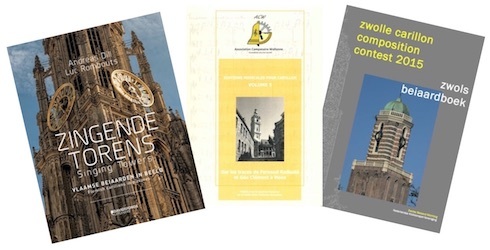 A book has been published to commemorate the restoration of the clockwork mechanism and the drum of the automatic chiming system in the tower of the Hippolytus church in Middelstum. This 32-page booklet, with beautiful color photographs, was produced by the Oude Groninger Church Foundation. It is part two in the series 'Clocks and Clocks' and was written by Henk Veldman, the town carilloneur of Middelstum. From 2018 onwards Leeuwarden revives the position of city carilloneur. 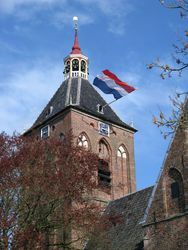 The Sint Anthony Gasthuis raised funds to have the carillon of the town hall played every week of the year in which Leeuwarden is European Cultural Capital. The carillon was played weekly until 2010. 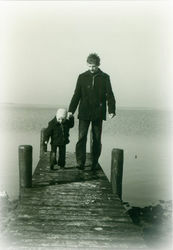 At that year, unfortunately, Leeuwarden ended the position in order to cut down expenses. 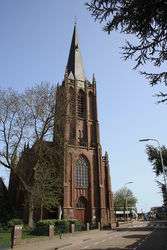 The carillon in the tower of the Basilica of the Holy Cross in Raalte was no longer played because of municipal spending restrictions at beginning of this year. Carilloneur Henk Veldman has recently been able to let the residents hear again, on Wednesday mornings during the weekly market, what a beautiful instrument the village possesses. The recently established foundation 'Vrienden van de Baardaard Raalte' has agreed with the municipality that the foundation will in any case pay the carilloneur for the next three years, while the municipality is responsible for maintenance, insurance and electricity consumption. The carillon, including the computer that plays one of the forty pre-programmed chimes every quarter of an hour, is owned by the municipality of Raalte. “The carilloneur who changed into a bell” is a music and theatre performance, depicting the life and death of the carilloneur Sjoerd Tamminga and his rebirth in the form of a bell. The music is by Jorrit Tamminga, composer and initiator of the project and the son of Sjoerd Tamminga, the main character of the piece. 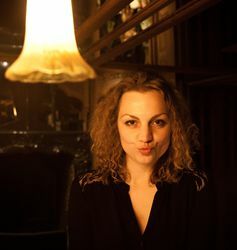 Katinka Polderman wrote the texts, that she also speaks and sings. Polderman is a well known comedian from the province of Zeeland, but these songs are in a serious mode. One of her great-uncles was a carilloneur and, like Tamminga himself, city carilloneur of Goes. In the first week of July, the nineteenth congress of the World Carillon Federation took place in Barcelona. The city itself has one instrument situated on top of the Palau de Generalitat, the seat of the Catalan government. 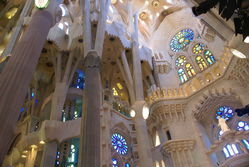 The clocks hang in an open structure inspired by the crown of one of the towers of the adjacent cathedral. The listening venue inside the palace is really very delightful. Carillon concerts in the winter? Must be possible. Hence our proposal for a special festive concert: “Christmas in the air.” This could be a free-standing project or could be incorporated into a Christmas market with a role for the carillon. This musical project immerses the town in a wonderfully relaxed Christmas atmosphere. 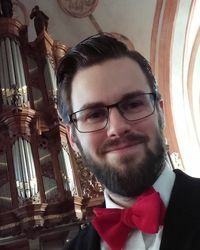 From the carillon tower, jazz singer Kim Versteynen sings some Christmas standards (with amplification from the sound holes at the top of the tower) and is accompanied by Jan Verheyen on carillon. On August 13 I visited the Trinity Lavra Monastery in Sergiyev Posad north of Moscow to see the largest bell in Russia which is in use. It was cast in 2003 by Igor Savelev in St. Petersburg and hangs in the 289 feet high 18th century monastery belltower. It is an exact copy of the Tsar Bell cast by Mikhail Motorin in 1748 and destroyed by the soviets in 1930. It weighs 79 tons and is 14 feet 7 inches tall. The Trinity Lavra Monastery was established in 1337 by St. Sergius of Radonezh.